Enter the world of Steampunk Adventure and find the stolen "light" from your city. Steampunk Adventure is a shooter platform game in a steampunk style: help the hero to find the way out of the labyrinth to complete the game and restore the light in the Endelamp city. Defeat the robots and fight the boss monster! Find the mazes exits! Use different weapons, follow the white rabbit to find the right way! out! 10 different levels, many robots!! OS: Windows XP SP2+, Mac OS X 10.8+, Ubuntu 12.04+, SteamOS+. NOTE: Be sure to test the FREE DEMO to check out if your system is compatible with these requirements. THE SOFTWARE IS PROVIDED "AS IS", WITHOUT WARRANTY OF ANY KIND, EXPRESS OR IMPLIED. IN NO EVENT SHALL THE AUTHORS BE LIABLE FOR ANY CLAIM, DAMAGES OR OTHER LIABILITY, TORT OR OTHERWISE, ARISING FROM, OUT OF OR IN CONNECTION WITH THE SOFTWARE OR THE USE OR OTHER DEALINGS IN THE SOFTWARE. The Android Demo is a fully playable game with 6 levels and this may have differences in performances with the Windows version (official and completed version). The Windows/MacOSX DEMO is a fully playable game, with 2 levels: try this version to test your system with the requirements. On the other hand, the game looks promising and interesting, yet the controls are still a lil bit sluggish and there's maybe a few troubles with the hitbox and stuff. Anyway, it's understandable on early versions of any game/app. Good job, and please let me know If you're interested in me, reporting bugs for you! Hi MANI Testing, thanks a lot for your test report. 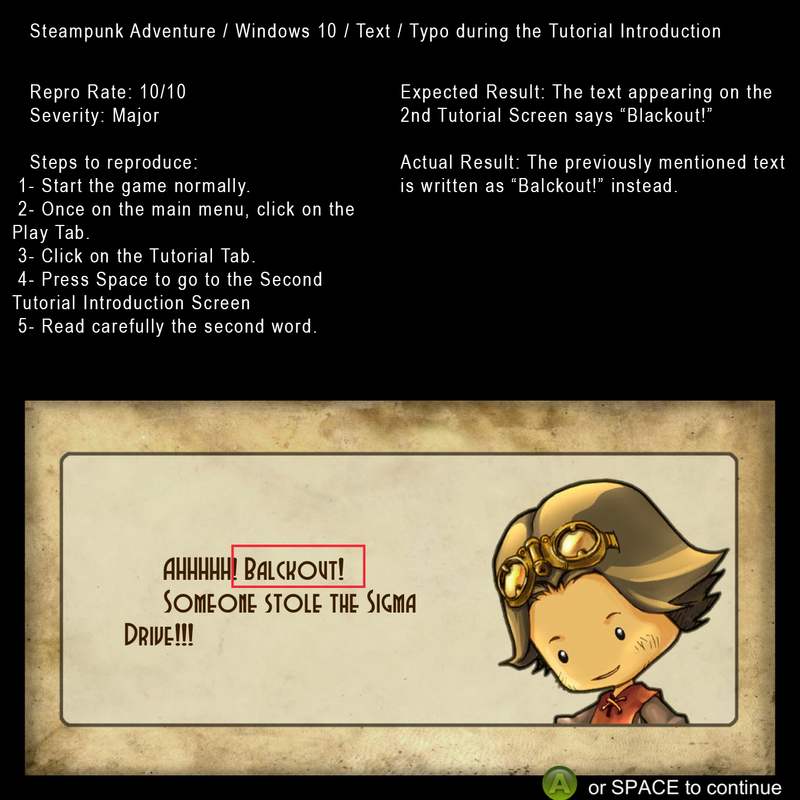 At the moment we're working on a new Steampunk Adventure version (with different game logic and more levels), so we surely need a beta tester. Drop us a line in PM. Btw, I'd love to PM you for more information and so, yet I'm kind of new on this page yet, so I don't know hoy. I don't even know if that's possible in itch.io. But maybe I could send you an email? I'm really looking forward to become a pro tester someday, so I'd love to participate in all of your projets, specially in order to improve my experience as a tester, and build up my curriculum :) Thanks for considering me, and please let me any contact mail or something in order for me to contact you! The controls are quite sluggish and awkward; the turning is incredibly slow and this ruins any rhythm or elegance to the player's movement. However, I understand that it may be a necessary design choice to ensure that you can't finish the maze too quickly. The game also lacks a lot of polish. There are many tiny details that just make the game feel kind of clunky and unprofessional, like the default text-to-speech voice, the way that the "trapped" tiles fall slowly and linearly, leaving behind perfectly square gaps leading to nothing, and the way that the steam coming from the robots seems to be an opaque, monotone gray color. These things don't really make the game bad, but they make it look kind of dodgy and could deter players from checking it out. I also got tired of the music track (from the first levels) pretty quickly; I think it could use some variation. However, I can tell that a lot of effort was put into the artwork and the concept, and it indeed looks great (if a little rough around the edges). The HUD design is also pretty endearing. I found the rabbit mechanic quite amusing as well. The game-play itself is not too bad either, nothing ground-breaking, could probably use some more variation, but there's enough to it to keep it entertaining for a while. It's an alright game, and you did a good job. However, especially if you're making it a commercial product, I think it would be a worthy investment to polish it more thoroughly, making sure it looks and feels smooth and professional. We're working on better controls and better level variations, we wrote a level editor (in Java) for the levels design. That looks cool. I look forward to seeing your improvements!